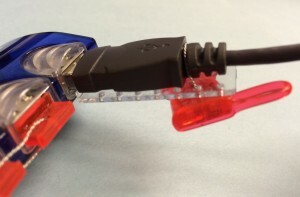 USB ports with attached cables in use on computers, servers, routers or other equipment are also at risk for a security breach. Cables can be removed to gain access to the USB port, and then replaced without your knowledge. PadJack’s USB Cable Locks secure cables and protects critical data and prevents disruption of data flow to peripheral devices. Secure your USB cables with the PadJack USB Cable Lock and Seal. It is a simple, cost effective solution to secure USB cables and deter port access. Each piece is laser-etched with a serial number for tracking. The USB Cable Locks are reusable, but the Wire Loop Seal is destroyed upon removal. Additional seals can be purchased separately.